Sequel to intervention by well meaning and concerned Nigerians over the recent suspension of UNICEF operations in the North East theatre of operations, the Theatre Command Operation LAFIYA DOLE convened and held an emergency meeting with representatives of UNICEF this evening. Colonel Onyema Nwachukwu, the Deputy Director , Army Public Relations, Theatre Command in a statement Saturday said during the meeting, the Theatre Command admonished the representatives of the organization to desist from activities inimical to Nigeria's national security and capable of undermining the ongoing fight against terrorism and insurgency. 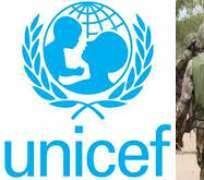 The Command also urged UNICEF representatives to ensure they share information with relevant authorities whenever induction or training of new staff is being conducted in the theatre. Consequently, after extensive deliberations on the need to seek modalities to work harmoniously with the security agencies in the theatre of operation, the Theatre Command has henceforth lifted the three months suspension earlier imposed on UNICEF activities in North Eastern Nigeria.